If you listen very carefully, you might still hear these wonderful young people singing gaily over all the decades … you know the song … why not join in ? 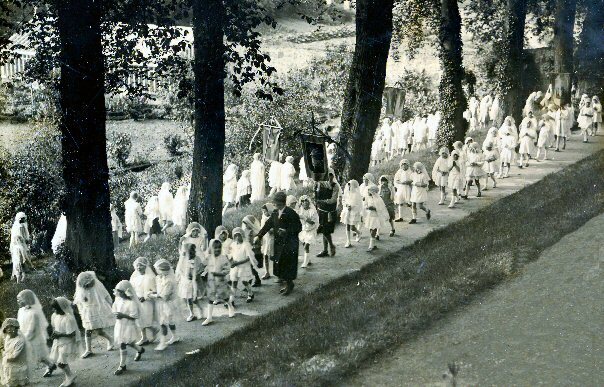 This lovely photo, donated by Patricia [Trish Gregor-Murray] who also supplied the text below, shows a procession of some of Newry’s little people (May Day) at St Clare’s Convent about eighty years ago. "My darling mother Maureen and her sister Josephine are shown. They are the daughters of Joseph Cullen and Margaret Curran. My grandfather, Joseph Cullen is the son of Peter Cullen and Margaret McArdle of 30 St Mary Street, Newry. Peter was the Clockmaker and Watchmaker. Francis, the eldest son died at the age of 17. Patrick was another son He played the piano for the ‘silent movies’ at the Frontier Cinema on John Mitchel Place. John, who worked with his father, carried on the watchmaking business at 30 St Mary Street, after the death of his father. He attended the Town Hall clock and the clocks at St Clare’s. Sister Louis OSC confirmed this when she showed us around the Convent, when my husband and I visited her. On your site was listed my grandfather, Joseph Cullen and his brother John. I now know, thanks to your site, the Regiment Johnny (as he was more fondly known) was in. He walked with a limp due to the tread of a tank breaking and the tank then running over his leg. I wonder if any or your readers would remember 30 St Mary Street with Mr Cullen the watchmaker? The address had other connotations as some of ‘the boys’ were sneaked out the rear and off onto the river from this address! So many stories to tell, so little time. Johnny was in a public house one night and a bet was taken that he would not be able to take apart and put together again a large Canadian watch in a set time. The big fellas eyes popped out when he saw one piece become so many. Sure enough, Johnny won his bet. John Cullen died on the 6th February 1938 (Unmarried). Joseph Cullen died 11th June 1968. Francis Cullen died 25th September 1903. Mary Margaret O’Rourke (Cousin- Father: Thomas O’Rourke, Mother: Mary Ann Curran). Maggie Woods of North Street. Mary Catherine Holden of Church Street. Mary and Maggie Trainor of John Mitchel Street. Mary McCall (Had a brother Mick) of High Street. Cora Mullen – uncle had a sweet shop in Hill Street. Sarah McAteer of Warren Point Road. Mora Fitzpatrick of North Street. Sister Mary Anthony- Head of St Clares, High Street, 1930/32. John Kelly of John Mitchel Street – Used to sell ‘penny sliders’ from his ice-cream hand cart. Barney Cunningham of John Mitchel Street.